Desktop stands offer all the ergonomic benefits of an adjustable height desk at a fraction of the cost, and without the need to replace your existing desk. 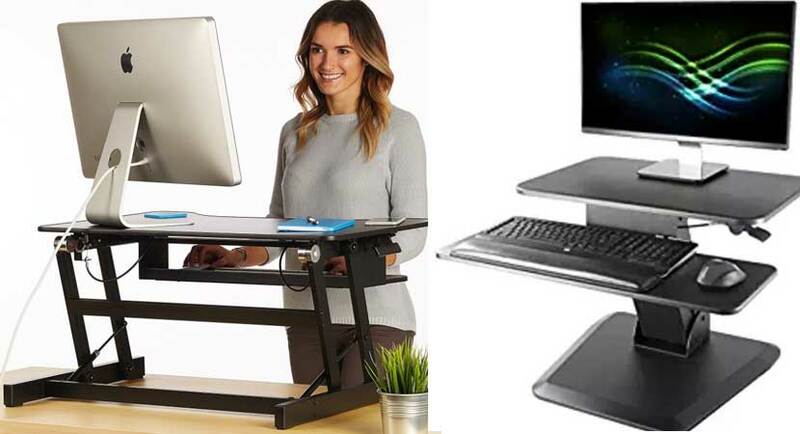 They can range from simple risers that raise the height of your monitor and peripherals to keep them at eye level, to standing desks that actually let you alternate between sitting and standing, a key component to staying healthy while working. 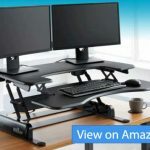 In this guide, we review and compare the best desk risers and laptop stands that dramatically improve the ergonomics of your workstation. All of them have been evaluated and recommended by our panel of experts to ensure your sedentary lifestyle does not get the best of you. Executive Office’s sleek looking laptop stand is a genuinely astonishing product. Doubling as a laptop desk, standing desk and laptop riser, this portable device offers excellent ergonomics for users on the go. The desk achieves its high level of adjustability using 3 rotating mechanisms in each leg, allowing it to contort into all manner of positions. 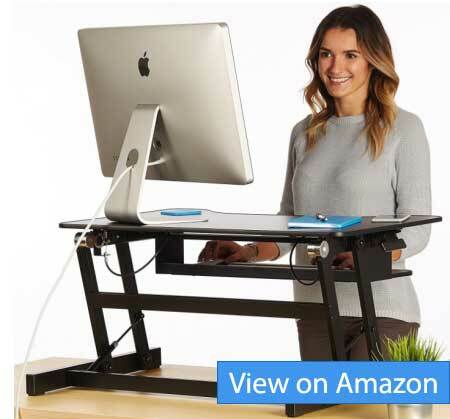 It can be used as a simple 1.5 inch riser or a full-fledged standing desk thanks to its 20 inches of extension. Moreover, the lightweight aluminium and plastic construction as well as the freedom to flatten it completely make it conveniently portable. The stand also features two USB powered built-in cooling fans to keep your laptop cool while the included mouse pad is a nice add-on. That said, the adjustment mechanisms take some getting used to and are not particularly intuitive. The narrow base and high extension also mean it not the most stable product in this line-up. 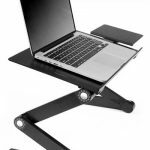 However, given the freedom to return it no question asked, the high level of adjustability and excellent customer reviews make this a definite competitor for any ergonomic laptop stand. Moving out of the budget end market, we get a chance to enjoy the excellent sit-to-stand monitor riser form Lorell. With plenty of space to accommodate up to two monitors as well as a keyboard tray, this versatile product is a must have for the modern work desk. What is immediately noticeable about this desk is the large of amount of space it offers. The keyboard tray is also very ergonomic with its wide, deep design which gives you plenty of space to keep your wrists angled comfortably. 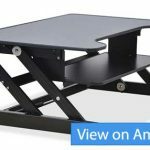 The adjustment mechanism is also quite simple, letting you vary the monitor stand from 6 inches to 12 inches and anywhere in between, letting you use it as simple monitor riser or a standing desk. With a reasonable price and large amount of real-estate, Lorell’s offering is certainly one to consider. There are some quality control issues reported with the materials and finish while the lack of hydraulic assistance in raising the desk is quite noticeable especially when it is fully loaded. That said, the reasonable price and one year warranty makes it a steal given the high level of adjustment. 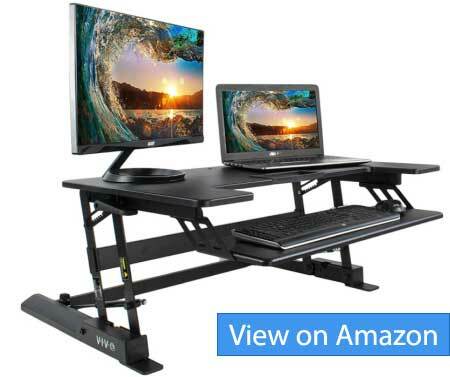 VIVO’s contribution to the sit-to-stand desk market improves on the Lorell’s design, giving you great real-estate while using gas springs to allow easy adjustability. 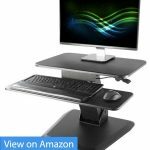 Easily varying between 6.5 inches to the fully extended 16 inches, this sit-to-stand desk is ideal for a crowded workstation. It can easily accommodate two monitors or a laptop and monitor with a built in tray for a keyboard and mouse. The desk is easily adjusted with assistance from the gas springs and can be locked into 8 possible positions ranging from sitting to standing. The budget price coupled with the steel frame make this one of the best value for money products in our line-up. That said, the quality materials is slightly lacking with some users reporting issues during assembly. However, the high level of adjustability and generally quite positive customer feedback means this is definitely a contender for the best sit-to-stand desk. 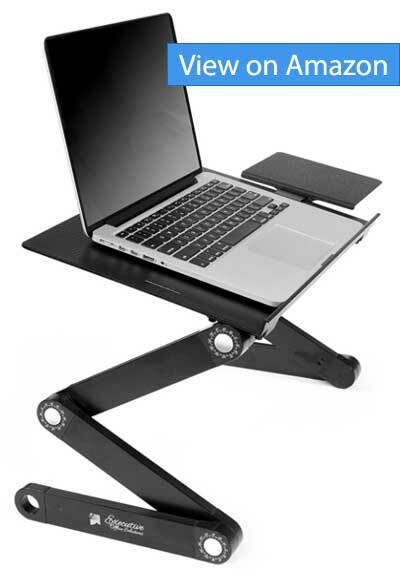 The X-Elite by Stand Steady is the perfect compact sit-to-stand desk for a cluttered desk. It gives you a wide range of adjustment and its well thought out size ensures it does not take up too much space without compromising on convenience. At 28 inches by 20 inches, the X-Elite is a great size, easily capable of accommodating two monitors as well as a keyboard. The design is well thought out with the desk rising in place within its footprint, which is quite handy compared to most sit-to-stand desk moving outwards when fully extended, taking up additional space. The conveniently placed handle along the side controls the height adjustment through a gas spring mechanism, allowing you to vary the desk’s height from 2 inches all the way to 16 inches. In addition to the high adjustability, this sit-to-stand desk has one of the nicest minimalist designs with a simple large surface. Materials and finish is on point with laminated particleboard for the desktop and steel for the underlying frame. However, a few users do report some wobbling in the fully extended standing desk position when the desk is heavily loaded. That said, given the choice of 4 colors and reasonable price and great design, this desk is one of the best we have reviewed in this line-up. For desks where space is a major concern, VIVO has an ergonomic solution: their 23.5 inch sit-to-stand desk with its conveniently small footprint. 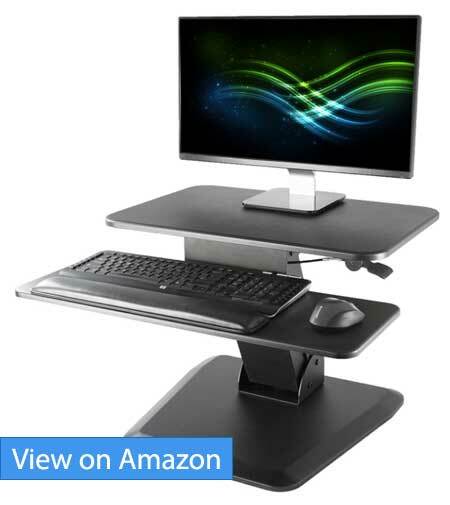 This two tier sit-to-stand desk features a tiny 19.5 inch by 19.5 inch base while still being able to hold a laptop, a monitor and a keyboard. The desk features spring assistance to help you move it even when loaded with a simple handle along the side. The range of motion can be varied from 6 inches to a massive 17.5 inches, giving you a lot of room to find the optimal position for your workstation. A steel frame gives this sit-to-stand desk a reassuringly sturdy feel while the anti-slip pad at the bottom ensures your desktop is safe from scuffs as well as slipping. That said, the surface is a MDF board which can present problems during assembly with some users reporting chipping and loosening screws. However, we didn’t run into any of those issues ourselves while putting the unit together. Given the price, the excellent ergonomics and the small footprint, this desk is a great budget sit-to-stand offering from VIVO. House of Trade’s heavy duty sit-to-stand desk is ideal for workstations with a lot of equipment, thanks to its 50 pound weight capacity. 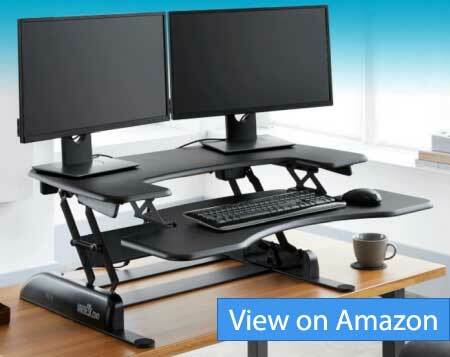 This sit-to-stand desk features a familiar two tier setup with plenty of room for two large monitors and a keyboard. Conveniently placed hand levers on both sides help control the air pistons to aid you in lowering and raising the height from the full 16 inches to the minimal 6 inches. However, as with most of the budget desks we have reviewed, the quality of desktop materials is questionable, although this particular model does not require assembly so you don’t have to worry about screws loosening while setting it up. The aluminium frame is a nice touch and does give it a reassuringly sturdy feel. 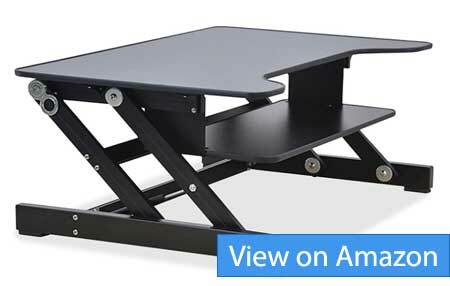 All in all, given the convenient design and large weight capacity, this is the best large budget sit-to-stand desk we have tested. 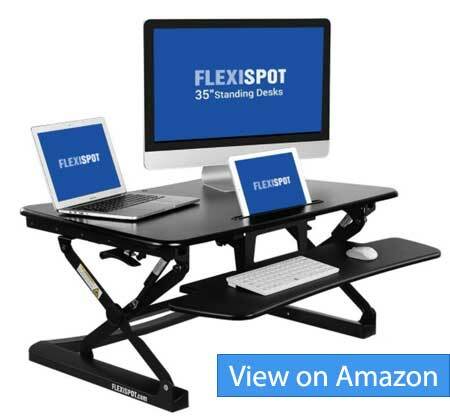 Moving into the higher end spectrum of sit-to-stand desks, we have Flexispot with their M2B desk. The higher price gets you excellent ergonomics, top notch materials and a large desktop to keep your healthy despite those long hours at work. 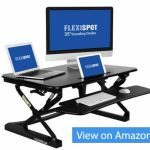 The biggest selling point of this sit-to-stand desk is the ability to raise it vertically within its own footprint, making it ideal for cluttered workstations. It also has a high quality gas spring system that has been thoroughly tested to ensure durability. The desk offers 12 different height adjustment levels from 5.9 inches to the fully extended 19.7 inches. The 35 inches by 23.2 inch desktop easily caters to your monitors and laptops with an additional groove for tablets as well. The solid metal is quite solid although the wooden particle board desktop is not ideal given the premium price point. A few users have reported issues during assembly when screwing parts directly to the desktop. That said, given the easy and wide range of adjustments and excellent ergonomics in a small footprint, this sit-to-stand desk is highly recommended especially with its reassuring 5 year warranty. Lastly, we come to the best sit-to-stand desk and monitor riser combo in our testing: the Veridesk Pro Plus. 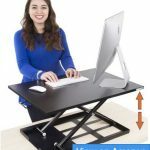 This product checks nearly all the boxes with its excellent construction, ergonomic design, and ultra fast raising desk mechanism. In short, this is the best overall sit to stand desk we recommend if you’re willing to spend a little more. The Veridesk pro features a large keyboard tray and desktop to easily accommodate two monitors on the top level, and a large keyboard and mouse on the lower tier. The desk supports 11 different height levels to carter to any working position without having to adjust your chair. Speaking of the raising mechanism, the Varidesk uses a patented spring loaded system that can lift or lower the desk in just 3 seconds. Why does time matter? 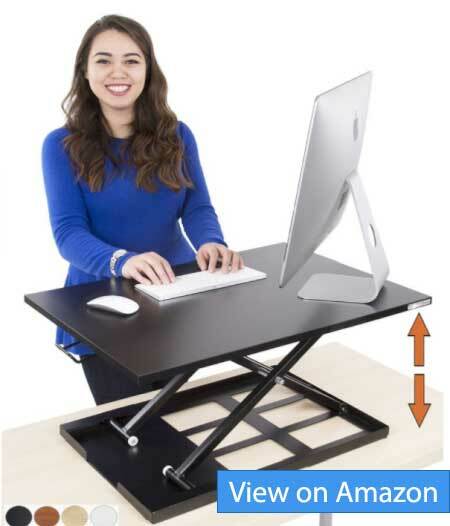 Well, a fast response encourages you to alternate between different height levels throughout the day, reaping the key ergonomic and health benefits of using a sit-to-stand desk. Another huge plus of the Varidesk is that it comes preassembled, which with a relatively complex design like this desk saves you a lot of hassle. All in all, the desk caters to all your ergonomic needs. However, it does have issues, namely that it takes up a lot of space when you fully extend it, moving upwards and outwards. Moreover, the high price point should justify a longer warranty period than the 1 year offered by Veridesk. That said, it is tough to find a sit-to-stand desk that offers this level of ergonomic design and high fit and finish, making it an excellent purchase for any workstation. All in all, sit-to-stand desks and monitor risers are must haves for a modern office or home workstation. However, a lot of users have queries regarding their use and effectiveness. Is sitting really that bad? In a word, yes. Sitting for extended periods of time has been linked to higher risk of heart disease, diabetes, depression, and even death. The risks cannot be mitigated even with exercise. The human body is simply not designed to sit for an extended period which is why standing desks are getting so popular. Don’t standing desks cause strain and tire you out? An excess of anything can be harmful, whether it is sitting or standing. 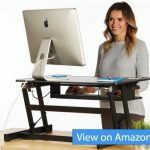 This is why most of our reviews focused on sit-to-stand desks that can easily allow users to sit or stand at their convenience. Varying between the two helps protect you from the ill effects of both. Standing at your desk breaks the monotony of sitting all day. It helps keep you more productive and focused by breaking the routine. Moreover, it also engages the muscles in the body helping you burn calories. How do monitor risers work? Monitor risers simply help ensure that your monitor screen is at the ideal height to keep you sitting straight, removing strain from your neck and spine. This is especially important for monitors that offer lower level of adjustability. The improved posture can keep you focused and prevent build-up of spine related issues in later life. 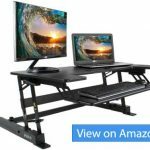 Which sit-to-stand desk is ideal for me? This is entirely dependent on your requirements. Budget is a primary concern for some people, which is why we reviewed a wide range of risers and desks. Then we have the added issue of how much space is available, where we recommend desks with a smaller base or ones that extend within their footprint. Last but not least, the amount of equipment you have is also a determiner of which desk suits your needs. So to conclude, shifting between sitting and standing will keep your engaged and healthy, helping your productivity and health while preventing the on-set of back problems. With these products, you can rest assured that all those long hours at the desk do not take a toll on your body.